A bold question indeed...and one I’m not altogether comfortable posing, for fear of disrespecting those who have worn the blue and white with distinction over the years. But it’s been something I’ve been mulling over for a good while now. And with every passing week, I’m finding it harder and harder to mount a case against. First things first, let’s get one thing crystal clear: I’m not saying Reece James is the greatest player ever to play for the club. That would be a monumental insult to the likes Arjan de Zeeuw, Andy Liddell, Emmerson Boyce, Roberto Martinez, Graeme Jones to name just five. Genuine Latics legends, on and off the field, for a sustained period of time, who deserve to be revered for as long as the club is in existence. I’m talking specifically about being the finest footballer, in terms of ability, quality, raw talent. I’ve always put forward Antonio Valencia as the ‘best’ player I’ve seen in a Latics shirt. His performances persuaded Sir Alex Ferguson to shell out £16million – still Wigan’s record sale – to replace Cristiano Ronaldo, no less, in the summer of 2009. A decade later, and he’s still at Old Trafford, having been a first-team regular for all but the last few months of that time, and having skippered the side to trophies at home and abroad. Wilson Palacios would also have to be up there, with Tottenham paying £14million to take him to White Hart Lane. Sadly, the kidnapping of his brother back home in Honduras, and a number of serious injury problems, prevented him realising his undoubted potential. Roberto Martinez once claimed James McCarthy was the most technically gifted player he’d managed. And Shaun Maloney also deserves an honourable mention for his role in the incredible finish to the 2011-12 season, when Latics avoided relegation with seven wins from the last nine matches. With Latics dropping out of the top flight in 2013, it seemed unlikely – for the time being at least – we would ever see players of that level again. But then a fresh-faced 18-year-old rocked up at Euxton last summer...and changed all that. I vividly remember interviewing him on his first day, and asking whether he could play anywhere other than right-back, given Nathan Byrne was the club’s reigning player of the year. “I’m here to play right-back,” replied James, who’d also just been named player of the year – for the Chelsea Academy, for whom he was captain. Not in an arrogant or cocky fashion. Just a total and utter belief in his own ability. And a grounded attitude to boot, with a great family network around him to keep his feet on the ground. I remember on the morning of the pre-season friendly at Rangers, my wife telling me she’d been speaking to a lovely gentleman in the hotel reception, who’d spotted the boys’ Latics shirts. He’d come over and revealed his son, Reece, was playing for Wigan that day, and how proud and excited they were about the season ahead. Goodness knows how much James Snr has spent in travel over the last season, given Reece’s younger sister, Lauren, is a superstar in her own right, down the road at Manchester United Ladies! “Reece was initially brought in as defensive cover,” boss Paul Cook revealed last month. Despite not having played a senior game when he arrived, James – who turned 19 in December – is the only Latics player to have featured in every league game this term. And he’s produced several stand-out moments during the campaign to date. There was the nonchalent free-kick he sent into the back of the net against Leeds in front of the Sky cameras, on the day the Whelan family said an emotional farewell in November. There was the dispossessing of a West Brom opponent on the edge of the box at the Hawthorns in January, before taking a touch and spraying a 70-yard pass on to the bootlaces of Josh Windass on the far side. There was the backheel-flick-nutmeg at Blackburn earlier this month that required multiple viewings to process what had happened. There was the sight of big Clayton Donaldson of Bolton attempting to shoulder-charge him off the ball at the DW the other week – only to end up on the floor, wondering what had hit him. And that’s just off the top of my head. You’ve probably got your own favourite. “He’s already a top young player, and I think he’s going to be a top player,” assessed Derby boss Frank Lampard – one of James’ heroes growing up as a Chelsea fan – after the DW clash in December. Unsurprisingly, James was named in the Championship ‘team of the season’ earlier this week, voted for by opposition managers. “Well deserved young bull...just the start for you,” tweeted skipper Sam Morsy. “Well deserved Reece...no doubt will be in a Premier League team of the year within a few years,” added ex-chairman David Sharpe. 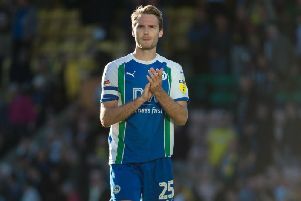 And his value to the side has been shown in recent weeks as – with Latics slipping into the relegation dogfight – he’s been switched to the centre of midfield alongside Morsy, with responsibility for taking all free-kicks and corners, on both sides. A remarkable show of faith in his ability by a manager who has long-since run out of superlatives. “I’m not speaking about Reece James,” Cook said in one post-match media conference last month. “I don’t need to. Speak to his team-mates in the Wigan dressing room, and they say the same. No airs and graces associated with some Premier League starlets who fail to make their mark at loan clubs for whatever reason. But someone who has bought into the club right from day one. Someone who turned down the chance to go elsewhere in January, such was his commitment to the cause. And someone who is destined to be a superstar for both club and country – having been pictured this week training with the full England squad for experience. “If every young player had his attitude, England would be winning a lot more trophies going forward,” mused Cook last week. Which is what every single Latics fan should feel as he hopefully fulfills that potential over the next 10-15 years. James has already helped England win the Under-19 European Championship and the Under-20 Toulon Tournament. It is surely only a matter of time before he receives his first senior call-up. Going back to the original question at the top of the page...it’s all about opinions. But I would stick my head on the block and say I haven’t seen better anyone in blue and white. Others may disagree, and that’s absolutely fine. But the very fact we’re even having this discussion underlines what an impact he’s made in just nine months. And what a glitteringly successful career he surely has in front of him.